Maintenance updates include minor fixes and enhancements. Maintenance updates are free, but can only be used with a specific year of Realtime Landscaping Pro. Scroll down to the year of Realtime Landscaping Pro you are currently using. Click the Download button to download the most recent update for that year. Modified the Model Import Wizard to import files created using SketchUp 2019 or earlier. Improved realism of plant models illuminated by spotlights during a Realtime Walkthrough. Modified Stone Edging to allow for a larger maximum gap between stones (up to 3′ or 0.91 m). Fixed case where the Height Painter tool was causing grass to disappear during a Realtime Walkthrough. Fixed cases where the Text and Overlay objects were appearing during a Realtime Walkthrough even though they were configured not to. Close Realtime Landscaping Pro 2018 if currently running. Click the download link and save the file to your desktop or other folder. Double-click the downloaded file to install the update. Note: This update will also update Realtime Landscaping Photo to the latest version. There are no maintenance updates for Realtime Landscaping Pro 2017. Fixed error that could occur when using a Plant Fill object with a Minimum Spacing of less than 6″ (0.15m). Fixed to automatically backup the design being edited when the file path includes the AutoBackup folder. Fixed error that could occur when importing a square photo. Fixed slight inaccuracy that could occur when moving a single point while using the Shift key to constrain movement to a horizontal or vertical line. Includes all changes in update 16.10, shown below. Fixed custom Pool Seat and Pool Stair materials to appear during a Realtime Walkthrough. Updated Oculus Rift drivers to support the newly released consumer version. Fixed case where creating a new Stream by loading a shape from the clipboard could cause an error. Fixed pool and deck lights to properly snap to vertical surfaces, and also to only snap to visible objects (and not to objects in hidden layers). Fixed plants to snap properly to the surface of Streams. Updated materials from Unilock, R.I. Lampus, and EP Henry. Added “Edge Style” for controlling region edge softness. Also increased max size in “options.ini” from 512 to 2048 to support extra sharp edges if desired. Added two varieties of black mulch. Added support for importing models from SketchUp 2016. Enabled specular lighting at night to make water more visible in a Realtime Walkthrough. Slowed down keyboard panning speed while designing. Rocks are now reported in the Project Material List based on their model, not their material. This allows different rock styles to be priced separately. Fixed error that could occur when starting a Realtime Walkthrough while using a non-looping Character animation with a positive start delay. Fixed case where movie creation could fail if the computer’s sound system was not working or the speakers were unplugged. Fixed Decks Stairs to only attach to visible Decks (and not to decks in hidden layers). Increased influence of Height Painter “Taper” property (most apparent when stamping a large custom brush shape). Fixed case where terrain grass patterns were appearing in the horizon line during a Realtime Walkthrough. Close Realtime Landscaping Pro 2016 if currently running. Added new materials from EP Henry. Added and updated materials from Unilock and R.I. Lampus. Added support for importing models from SketchUp 2014. Increased maximum terrain size in Google Maps Import Wizard to 2100×2100′ (640x640m). Improved quality of small curves. Increased max Sprinkler Head radius from 50 to 200′. Updated project material list message. Enhanced Art Browser to automatically scroll so the currently selected category button is visible. Improved material tooltip to no longer display internal numeric code for solid colors. When adjusting the elevation of an object using the mouse, the elevation now only snaps to 0 when global snaps are enabled. Replaced morning birds audio due to DRM false-positives on YouTube. Photo: Added full set of stone and paver materials to Edging object. Fixed movie creation to go to the correct YouTube website when the option is selected, which bypasses the normal upload dialog. Fixed Landscape Light area of influence cone color to match light color. Fixed case where Google Maps Import Wizard was accessing the incorrect zoom level, resulting in “no imagery here” message. Fixed plant pictures with the “flip vertical” option enabled to render properly during a realtime walkthrough. Fixed to draw 3D Dimension label at the correct size when exporting viewport to a file. Fixed Australia hardiness zone map and converted temperatures to Celsius. Fixed case where the Jumping Jet object was sometimes starting in the “on” state, even though a start delay was specified. Fixed UltraRes tree “Long Leaf Pine” which was dropping its foliage during a walkthrough. Fixed case where non-square textures were not tiling properly on borders. Fixed case where a flame effect could be added to a small spa that would normally only have one effect. Fixed case where pool water was not being property rebuilt during a realtime walkthrough. Close Realtime Landscaping Pro 2014 if currently running. If you have a question or would like to report a problem, please contact our support department. Added R.I. Lampus Paver and Stone materials. Added support for adding deck lights which snap to vertical surfaces. Fixed case where part of the wall could show through doors or windows with closed blinds. Fixed case where printing the project material list could result in repeated blank pages. Fixed error that could occur when undoing changes to custom overlay materials. Fixed to allow full version to open trial designs which have been saved as archives. Fixed picture editor to link to correct online help. Fixed Sun Rays graphics setting to work globally instead of being specific to each landscape. Improved Plant Growth dialog performance and added progress dialog. Reduced spa water brightness at night for a more natural appearance. Fixed plant search to work with all plant types. Fixed plant pictures to render properly when time of day is set to Noon. Fixed the “Help > Check for Updates” command to work for updates newer than 8.12. Improved Realtime Camera movement when using a slow movement speed. Fixed error that could occur during realtime walkthrough when pond water level is set to 0. Fixed Plant Row and Plant Fill objects to update immediately when plant growth and season are changed. Fixed to allow deck stairs to be placed near the corner of a deck without removing both posts. Fixed Pool Stairs and Pool Seat to properly calculate finish area. 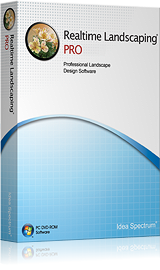 Close Realtime Landscaping Pro 2013 if currently running. Fixed potential error that could occur when resizing property window with an Accessory object selected. Fixed gap in terrain that could occur due to an overlay which is hidden during a realtime walkthrough. Fixed to disable Offset tool when an Overlay is selected. Fixed creation tools to avoid case where right-clicking and dragging combined with bringing up a dialog could cause an error. Fixed case where where custom plant names may not be properly saved and restored. Increased maximum memory usage to support extra-large designs. Increased sun size and improved quality. Fixed fountain spray object to consistently hide placement arrow during realtime walkthrough. Fixed fence board height to more closely match sloping terrain. Modified to always render water reflections and refractions when creating a movie or capturing a screen shot (instead of fading based on distance). Fixed case where fire and water effects may not render properly when mirrored. Fixed case where running a realtime walkthrough on a dual-monitor system could cause an error. 3D Text, Plant Fill/Row models can now be converted to custom models (e.g. to create chrome text). When returning from the Picture Editor, the original application window is now restored more consistently. Fixed plant symbols to render properly in top-down view when using 3D software emulation. Fixed water reflections which were rendering inverted. Improved region and path enhanced surface detail when viewed at a distance. Fixed error that could be caused by browsing for a large number of objects. Close Realtime Landscaping Pro 2012 if currently running. Added Golf Equipment, located in Accessories. Added Glass Panel Fences with matching gates, located through the Panel Fence tool. Added new Deck Balusters, accessible through the Deck tool. Added Residential Solar Panels, located in Accessories, under the “Other” category. Improved shadow quality on sloped terrain. Increased min/max terrain elevation from 100′ to 150′. Increased max custom model elevation to 150′. Fixed retaining walls to properly calculate their height when elevated and placed on a slope. Fixed panel fence gate styles that had a gap at the bottom. They now all properly line up with corresponding panel fencing. Area Grader changes: Fixed artifacts that could occur with multiple adjacent area graders. Improved outline quality. Improved compatibility with older landscapes. When creating Boxes, Cylinders, and Extrusion objects, the creation points now snap to elevated terrain. Modified the Extrusion object’s outline to remain attached to the object’s base instead of conforming to the terrain. Important: Due to improvements to the terrain system, objects in imported landscapes may require slight elevation adjustment. Fixed rare cases where temporary files could conflict when editing multiple landscapes at once. Fixed cases where temporary files were not always being deleted. Photo: Fixed Mask object to remove small gap that could appear on right side of picture. Close Realtime Landscaping Pro 2011 if currently running. Fixed Picture Import Wizard to return to proper page when Back is clicked from Picture page. Modified Overlays to support smooth alpha blending (hardware acceleration required). Fixed to automatically unhide hidden realtime cameras when creating movies. Fixed sprinklers to render properly when using the software renderer. Modified model import wizard to preserve file names for unsupported texture formats (to preserve grouping). Fixed possible error that could occur when importing models with over 32k triangles. Fixed flowing water to work correctly when creating fountains and waterfalls using the Model Creation Wizard. Added prompts when attempting to use the Model Creation Wizard to create an object that does not support water. Fixed error that could occur in Realtime Landscaping Photo when creating complex fill regions. Fixed some cases where flowing water wasn’t working. Please call or e-mail our support department to download this update. Close Realtime Landscaping Pro 5 if currently running. No updates are currently available for Realtime Landscaping Pro 4. If you have a question or would like to report a problem, please contact our support department. Fixed Stream object to save rock border option. Improved texture quality when using custom materials. Fixed garage doors to fit tighter against the house. Fixed tutorials link to go to correct web page (instead of home page). Fixed Realtime Landscaping Photo to go to correct web page when checking for updates. Fixed greenhouses to render properly at night (when using software rendering). Price lists are now loaded properly with saved landscapes. Fixed bug that prevented accessories from rendering on some older ATI video cards (affected Realtime Landscaping Photo only). Fixed negative metric elevations to display meters instead of centimeters. Removed black rectangle that would sometimes appear underneath sprinklers. Fixed Realtime Camera to display proper speed when using metric. Increased dimension line/text size when printing top-down view. Fixed bug that could cause plants to change when importing a model. Fixed to prevent a possible crash when using the Load Shape command with the Hedge object. Fixed the SketchUp model importer to work on systems with older versions of SketchUp installed. Enhanced error reporting system to save a backup of the current landscape if possible. Fixed Copy-to-Favorites command to prevent “texture not found” errors. Close Realtime Landscaping Pro 3 if currently running.